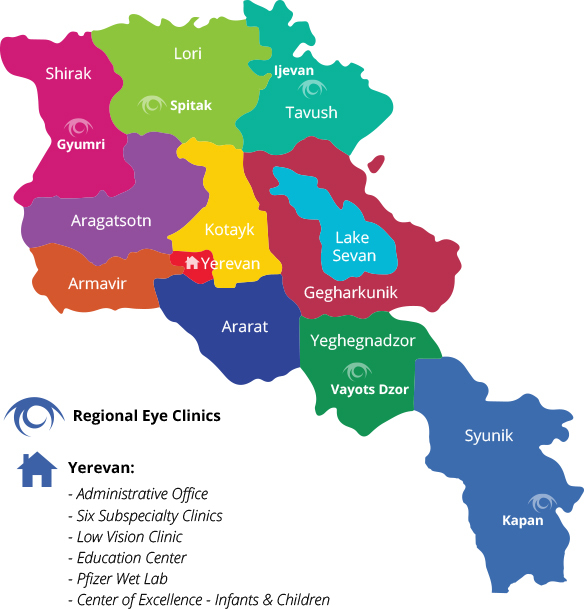 Armenian EyeCare Project » Our 25th Anniversary Trip to Armenia! Our 25th Anniversary Trip to Armenia! Eric and Diane Thomas said, “A trip of a lifetime!” Others described their Armenian Adventure as “Remarkable” and “Memorable.” And another, “I don’t want to wake up from this dream.” These are just some ways friends of the Armenian EyeCare Project describe their recent trip to Armenia with staff and physicians in celebration of our 25th Anniversary. 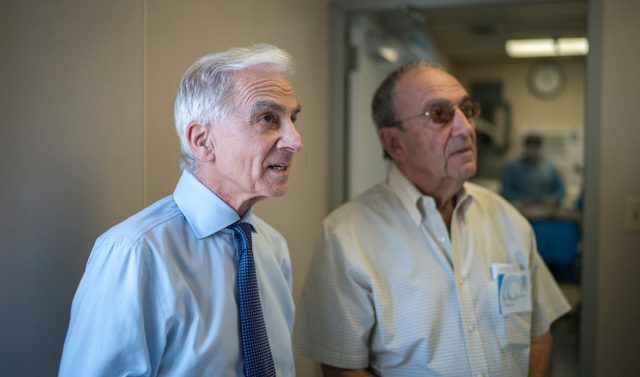 The EyeCare Project visits Armenia twice a year on Medical Missions, but this was the first time a group of donors joined the trip to learn more about the organization they support and to see firsthand how the Project provides eye care for people in Armenia. 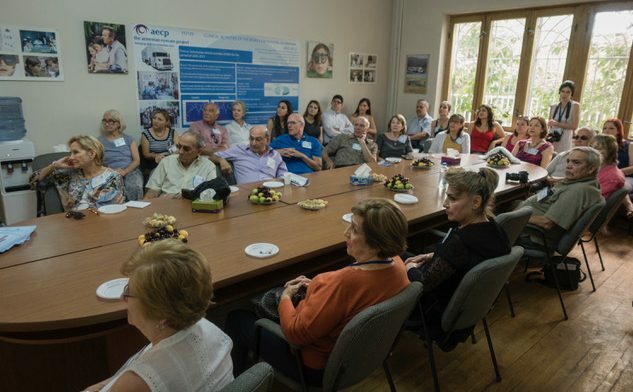 Our group learns more about our organization at the AECP office in Yerevan before heading out to tour our Subspecialty Eye Clinics at the Malayan Ophthalmological Center. One of the most noteworthy events donors got to witness was the Grand Opening of our newest Regional Eye Clinic in Armenia — the AECP Kapan Regional Eye Clinic — located in the town of Kapan in the Syunik province. Benefactors, along with AECP physicians and staff, joined Syunik Governor Vahe Hakobyan and representatives from Armenia’s Ministry of Health for a ribbon-cutting ceremony followed by a small reception. Located in the southernmost province of Armenia, our newest Regional Eye Clinic will allow those living in the southern part of the country to receive the quality eye care they need without having to travel several hours. Government officials and AECP staff hold press conference for Kapan Regional Eye Clinic Opening. 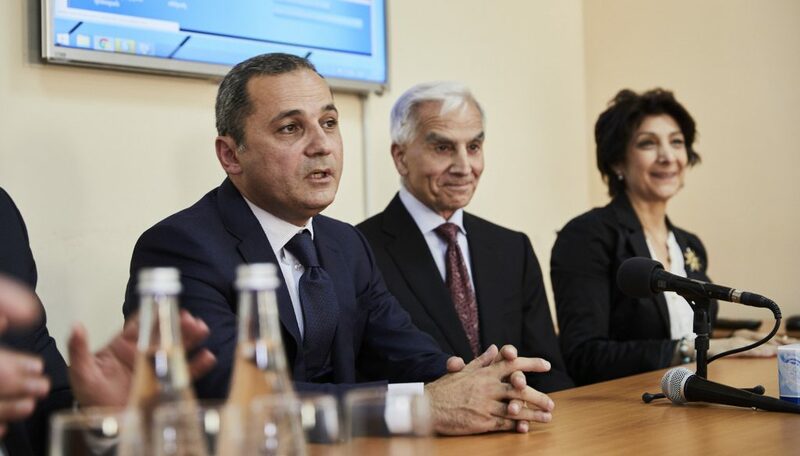 From left to right: Syunik Governor Vahe Hakobyan, AECP Founder Dr. Roger Ohanesian and AECP Country Director Nune Yeghiazaryan. Other AECP programs donors had a chance to visit and tour were the Subspecialty Eye Clinics inside the Malayan Ophthalmological Center in Yerevan; the AECP John and Hasmik Mgrdichian Regional Eye Clinic located in Spitak, Lori; and the Mobile Eye Hospital while stationed in the Gegharkunik province of Armenia. Dr. Ohanesian explains how eye care is delivered on the Mobile Eye Hospital to a group of AECP guests. Another guest said, “Next time they plan this trip they need to tell people, ‘You’re going to cry every day. '” Pearl Apisson, a nurse and an attorney, along with her husband, John, a retired ophthalmologist, traveled to Armenia from Florida. Pearl was so moved and enthusiastic about seeing the patients on the Mobile Eye Hospital that she greeted each one with a big hug! “There were about 25 people sitting on a bench by the Mobile Eye Hospital waiting to be seen. Most were indigent, over 70 years old, some with gold teeth, but all with big smiles,” Pearl describes. 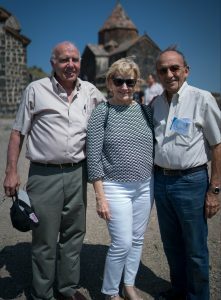 AECP guests Bill Torch, Pearl Apisson and John Apisson at Sevanavank Monastery, which overlooks Lake Sevan. In addition to visiting several AECP programs across the country, the more than 25 guests who embarked on our special Anniversary Trip also experienced rich historical and cultural tours during the 12-day excursion throughout Armenia from July 17-29. These included trips to some of the world’s oldest churches and monasteries, evenings filled with great food and traditional Armenian singing and dancing and much more. “This trip was a great way to meet lots of wonderful people from all over the U.S. with a common goal: a love for Armenia and a passion to help those less fortunate through eye care,” Sossie Dermenjian, from Fresno, California, said. For many on the trip, this was their first time in Armenia, which made their journey all the more important. 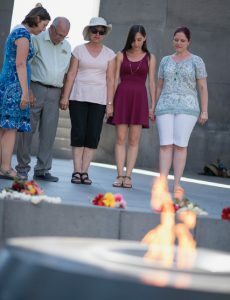 Carol Chiesa prays with her family at the Armenian Genocide Memorial in Yerevan. From left to right: Ruth Mazujian, Harry Mazujian, Carol Chiesa, Ellen Mazujian and Laura Juneja. Making the journey to her motherland “even more special,” Chiesa made the trip to Armenia with her brother and his family. “The AECP gave me the opportunity I needed to make this trip,” said Veronica Boursalian, another first-time traveler to Armenia. Another guest, Ann Christoph, shared some of her favorite moments from the trip, which included the spiritual singers at Geghard Monastery, the Armenian dance performance at Megerian Carpet, the beautiful landscape throughout the country, visiting the Armenian Genocide Memorial, and seeing the need for the EyeCare Project. “It’s very impressive what the EyeCare Project has accomplished in Armenia,” said Christoph, a landscape architect who lives in Laguna Beach. She heard about the trip through AECP Founder Dr. Roger Ohanesian, her eye doctor. “I loved the idea of traveling with people I know who have been involved in the country — not just tourists,” Christoph said. The EyeCare Project’s 25-year involvement in Armenia enabled guests to participate in a number of activities that most visitors to Armenia do not have available to them. 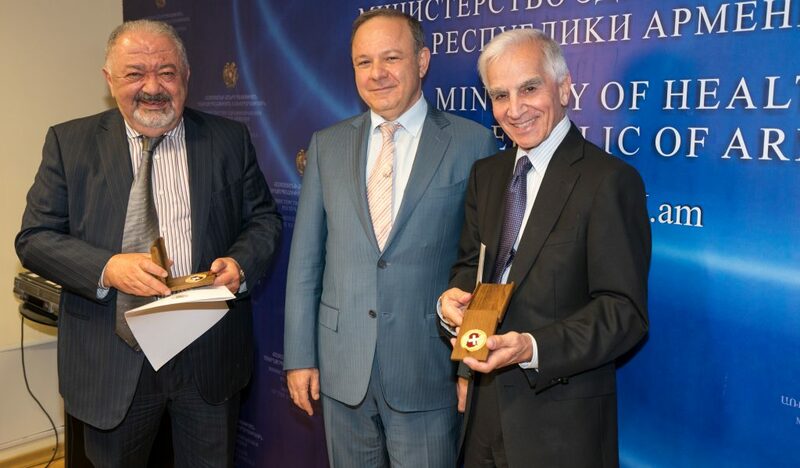 Armenia’s Chief of Ophthalmology Dr. Alex Malayan (left) and AECP Founder Dr. Roger Ohanesian (right) receive awards from Armenia’s Ministry of Health for serving Armenia. These activities included an Award Ceremony with Armenia’s Ministry of Health, in which Health Minister Levon Altunyan honored AECP physicians for their work in advancing eye care in Armenia. 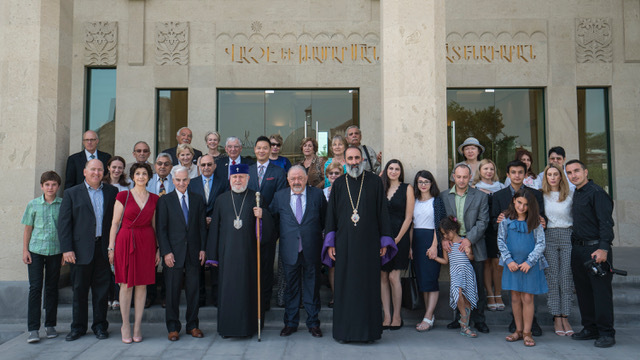 Guests also had a meeting with the Catholicos, in which the leader of the Armenian Apostolic Church expressed his gratitude to the organization for bringing sight to so many needy Armenians for 25 years. And as a special treat — lunch in a private home where everyone learned to make Lavash bread. AECP physicians, staff and donors pose for a picture with His Holiness Karekin II — Supreme Patriarch and the Catholicos of all Armenians — at Etchmiadzin. Another highlight from the trip was the annual ophthalmology conference organized by the AECP each year — the AECP 15th International Conference on Ophthalmology & Neonatology — where hundreds of ophthalmologists, nurses, residents and medical students traveling from all over the world met in Yerevan to discuss the latest advancements in ophthalmology and neonatology, making Armenia’s capital a destination for experts in the field to meet and learn about the most cutting-edge developments in eye care. AECP guests Michele Pellissier, Christie Bohigian and George Bohigian at our Gala in Yerevan, with beautiful Mother Armenia in the background. Culminating a fun-filled two weeks, the EyeCare Project celebrated one of our last evenings in Armenia with a special 25th Anniversary Gala at the Radisson Blu in Yerevan. 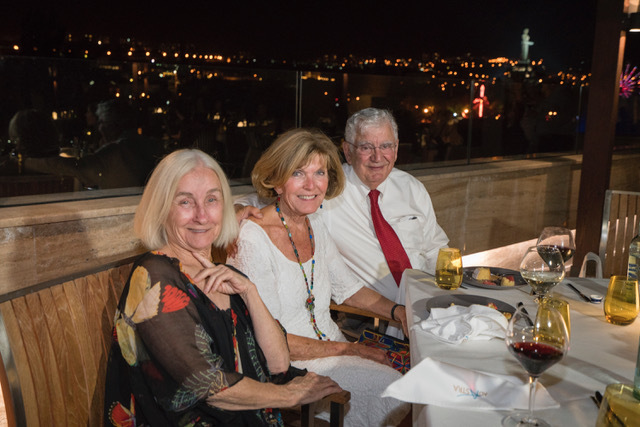 Overlooking a panorama of Armenia’s stunning capital city — with views of Mount Ararat and the Mother Armenia statue — guests enjoyed the company of new and old EyeCare Project friends, donors, physicians and staff while sipping local wine, savoring a delicious buffet dinner, and dancing the night away. The party was our way of saying “thank you” to all our donors and friends who support our many programs in Armenia. Our deepest gratitude goes out to those who joined us on our special 25th Anniversary Trip to Armenia and made it a truly once-in-a-lifetime experience — and to all our donors who continue to support the AECP.